The Granaries01692 582071work Self-catering"The Granaries" 4* holiday cottages are at Wayford Bridge on the banks of the River Ant, one of Norfolk's prettiest rivers. A family run complex of 5 well equipped cottages, there is an indoor heated swimming pool, sauna & gym all exclusively for residents of the properties. Each cottage also has a rowing dinghy, with buoyancy aids for all guests. This is perfect base for enjoying "Britain's Magical Waterland", the Norfolk Broads, as well as the county of Norfolk, which boasts stunning countryside and superb safe beaches, along with nature reserves, heritage sites, stately homes, historic buildings and theme parks. First rate shopping opportunities are easily accessible, with Great Yarmouth & Norwich only a short distance away. Fish, bird watch, explore, ramble, canoe, motorboat, exercise or shop, there is so much to do and see in Norfolk that this makes "The Granaries" a fantastic holiday home for everyone. Or you could just sit back and relax in your riverside cottage, using the free wi-fi, games, jigsaws, DVD and video libraries, or unwind in the sauna after a swim in the indoor heated pool. "The Granaries" 4* holiday cottages are at Wayford Bridge on the banks of the River Ant, one of Norfolk's prettiest rivers. A family run complex of 5 well equipped cottages, there is an indoor heated swimming pool, sauna & gym all exclusively for residents of the properties. 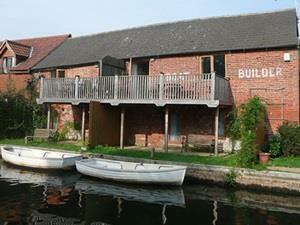 Each cottage also has a rowing dinghy, with buoyancy aids for all guests.